Downing Street has agreed to clarify the law on intruders but has insisted householders can already use force to protect themselves in their homes. Tory MP Patrick Mercer wants to pass a bill which would mean householders would only be prosecuted if they used "grossly disproportionate" force. Tory leader Michael Howard said the law at present was "topsy turvy". Earlier Metropolitan Police chief Sir John Stevens gave his "total support" to the Tory plans to change the law. Downing Street said: "We concede that there is a confusion there in terms of the use of reasonable force, and that that does need to be clarified. "That is a matter which the Home Office will study." Sir John said people should be able to use "necessary force" against burglars who enter their homes. The plans are being proposed in Parliament by Mr Mercer, who has come out top of the ballot for private member's bills. That means it is guaranteed parliamentary time but will need support from Labour and Liberal Democrat MPs to become law. The Home Office is already conducting an 18-month review of murder and manslaughter laws. Householders are currently allowed to use "reasonable" force to defend themselves against intruders. The bill would change the test for prosecutions. A Metropolitan Police spokeswoman said Mr Howard had met Sir John and deputy commissioner Sir Ian Blair, who will be the force's next chief. "They have not seen the private member's bill in full but do support the 'grossly disproportionate' threshold that Mr Howard suggests be used as the test for whether a householder should be prosecuted," she said. At a news conference at his party headquarters, Mr Howard backed the plans. 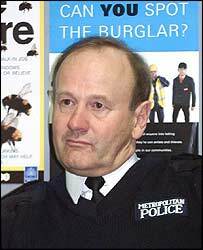 He said burglary was a serious crime which destroyed people's ability to sleep easy at night. "If a burglar breaks in, attacks you and you defend yourself, you can find yourself in the dock," said Mr Howard. "Most people think that's typical of the 'topsy turvy', politically correct world in which we live. Gone are the days when your home was your castle." Mr Howard argued the plans stood up for the "silent, law abiding majority" and would put the fear of imprisonment and physical injury with intruders, not householders. He said the law would protect people such as Kenneth Faulkner, a farmer who shot a burglar in the leg after his home was targeted three times. Mr Faulkner was arrested after the incident but not charged or prosecuted. Ministers say the law already allows defence but not retaliation and no change is needed. Some critics of the plan suggest it could create a "have a go" culture among some householders. Mr Howard denied that claim and said it would only introduce for criminal law the same test introduced by Labour for civil cases. A government law change meant burglars can only sue householders over injuries if there was "grossly disproportionate" force, he said. Mr Mercer said three senior Nottinghamshire police officers had privately welcomed the plan because they thought it would deter burglars and reduce violent confrontations in homes. He says his proposals would not have changed the case of Tony Martin, the Norfolk farmer jailed for shooting dead a 16-year-old burglar in 1999 as he ran away from the farm. Earlier this week, Lord Chancellor Lord Falconer agreed it was important people knew they could use force to defend themselves but argued no law change was required. "What we need to do is make people aware that that is the law," he said. "I am not sure that changing around the legal test is what would make the difference." Investigations into such cases could not be avoided, he said.